Syracuse freshman Chris McCullough (#5) takes a shot on Kennesaw State. He had a double-double in his collegiate debut with 16 points and 11 rebounds. 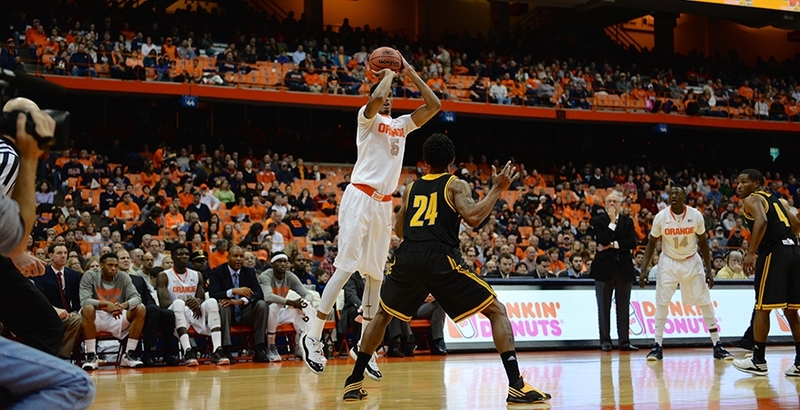 Chris McCullough had a double-double in his collegiate debut with 16 points and 11 rebounds, while sophomore B.J. Johnson offered 19 points to go along with eight rebounds off the bench. The pair more than replaced the production of Michael Gbinije, who was scratched from the game for undisclosed reasons. Senior Rakeem Christmas led all scorers and set a new career-high with 21 points to go along with nine boards, taking full advantage of a small Kennesaw State frontcourt and punishing the big men down low. While the offense may have stalled at the start, it ran relatively smooth the rest of the game. Despite having as many points as turnovers (four), freshman point guard Kaleb Joseph pushed the ball up the court after seemingly every rebound. He displayed great court vision, connecting with a slicing Chris McCullough on one occasion for a thunderous slam midway through the first half. It was one of Joseph’s six assists on the night. With a squad that Boeheim believes is a much better rebounding team than in years’ past, the ability to create fast-break points off rebounds and turnovers could prove critical for Syracuse’s success this season. When his teammates are hitting shots, though, he believes the Orange is a force to be reckoned with.